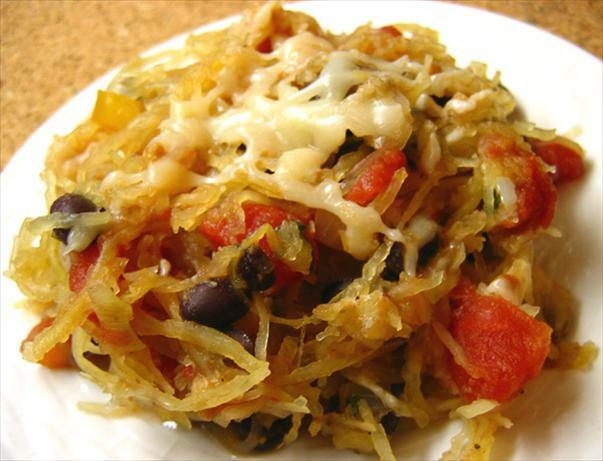 Spaghetti squash is a winter squash that is very high in nutritional value. As the name suggests, this vegetable looks like spaghetti noodles when it is cooked. Spaghetti squash is known by many names, such as vegetable spaghetti, spaghetti marrow, gold string melon and fish fin melon. Though the rind can be green or white, most of the time, this vegetable is cream, yellow or orange. The center of it has large seeds and the fleshy part is dark yellow to orange. Each serving is one cup of spaghetti squash. The nutritional value of spaghetti squash is amazing. The vitamins and minerals contained in the squash prevent heart disease, cancer, and the inflammation caused by arthritis. Brain function can also be improved by the omega-6 fatty acids in the spaghetti squash. 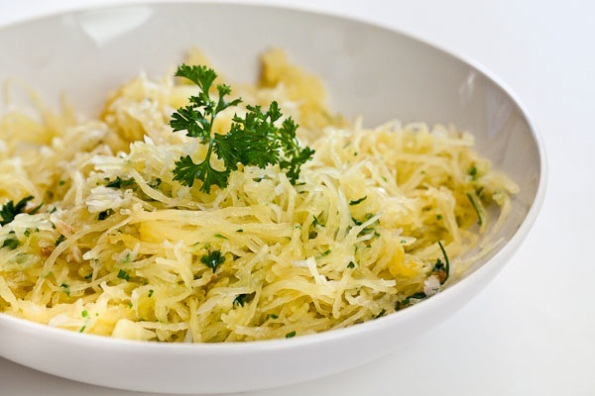 Spaghetti squash is a great source of potassium and folate, both of which are beneficial to pregnant women. The antioxidants in the squash prevent cell damage and vitamin B helps cells function better. 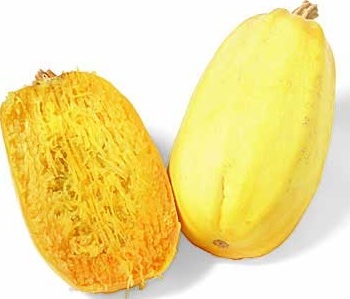 Spaghetti squash has beta carotene which is very useful to people with insulin resistance and to prevent atherosclerosis. Recently, its benefits for the prostrate have become known. Prick squash with a fork and bake in oven until it is soft (about an hour). 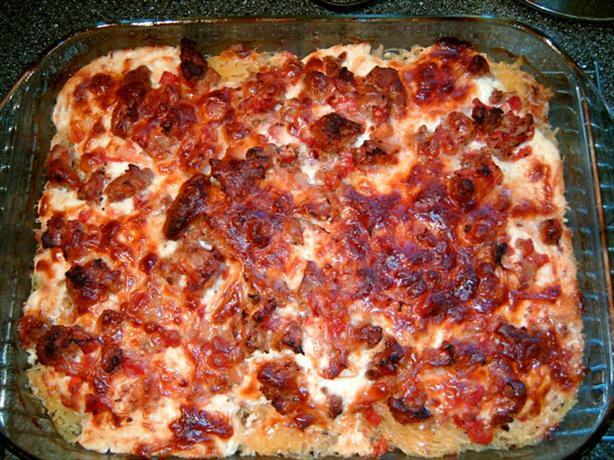 Brown the turkey sausage with 1 tbsp. olive oil, crumbling as it cooks. Add half of garlic and onion when the meat is brown. Continue to cook when the onion is transparent and then add tomatoes after chopping them up. Cover the pan only partially and stir once in a while as it simmers with low heat for a few hours. Then add pepper and salt to taste. Cut the squash in half and remove the seeds when it is cool. Scoop out the rest of the squash and set aside in a large bowl. Add rest of garlic to rest of olive oil in a big frying pan over medium heat. When the garlic is fragrant, add sauté and spaghetti squash to cook for a few minutes till the squash begins to brown. Add salt and pepper to taste. Stir half of mozzarella cheese, egg and rest of cheeses. Preheat the oven to 375 degrees and then pour a spoonful of sauce in the bottom of pan. Put the squash in and top with the ricotta cheese mixture. Pour the rest of the sauce over the dish and then top with the mozzarella cheese. Bake for an hour until brown and bubbly. Let the dish sit for 10 minutes. Poke the squash with a fork to let steam to escape. Cook in microwave for 5 minutes on high. Turn the squash over and cook 5 more minutes or until it gets soft. Let the squash sit 5 minutes. Cut squash in half and take out the seeds. Use a fork and scrape the insides of the squash to make strands. Keep one half of the shell. Mix the squash with ingredients and add salt and pepper to your liking. Put back into shell and serve. 1 spaghetti squash, about 2 lbs. Put spaghetti squash in baking pan. Pierce with a fork. Bake at 350 degrees for 45 to 60 minutes then let it cool. Cut squash in half lengthwise and take out the seeds. Using a fork, separate the squash into strands. Put in bowl. Using a big skillet, heat the oil medium-high heat. Cook the garlic and green onions in oil for 3 minutes and stirring constantly. Mix in the squash and stir-fry 3 to 5 minutes until completely heated. Add parsley and lemon juice and stir. Add the cheese and stir to coat. Cut squash in half lengthwise. Take out and throw away the seeds. Put the squash, cut side down, in greased baking dish. Bake 45- 60 minutes or until tender. Use a fork and take out spaghetti-like strands and place in bowl. Stir in the tomatoes with their juice, the rest of the ingredients and stir well. Spray 1 ½ quart casserole dish with cooking spray. Put mixture into dish and sprinkle the rest of the cheese. Bake uncovered, until heated through – usually 30-35 minutes. 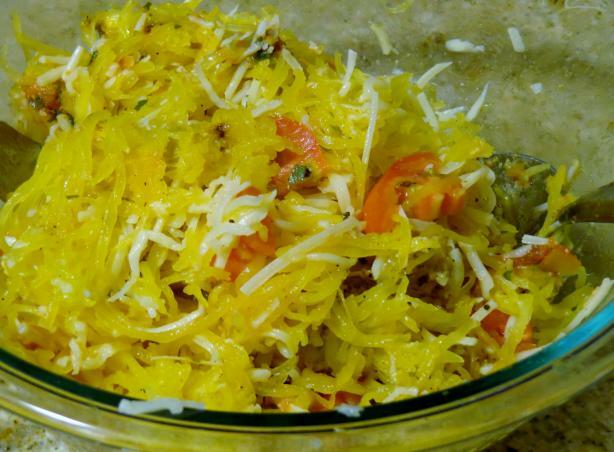 If you are looking for something different to try, spaghetti squash is definitely a great option. The health benefits are numerous and it is easy to prepare. Many recipes are available so you are sure to find one that your whole family will love.